Josh and Sophie are fraternal twins and children of archaeologists. Sounds cool, right? Well, maybe, if you prefer not to be part of archaeology digs and instead live with relatives every summer. Oh and the constant moving to a new college town. Josh and Sophie have adapted quite nicely to the life, keeping in touch with friends in different cities through email and the like. Every summer they live with a relative in San Francisco and do typical teenage activities, like get summer jobs. Josh notices a small bookstore looking for a clerk. During his interview, Sophie spends her time across the street at a coffee shop. Sounds like a great opportunity to talk up your brother when the wife of the bookstore owner happens to show up for some coffee, doesn’t it? After a simple greeting, the wife heads back across the street. Sophie is offered a job at the coffee shop just as Josh is offered the job at the bookstore. Coincidence? When a Dr. John Dee decides it’s time to take care of some unfinished business with the owner of the bookstore, Sophie races across the street to help her brother, as a group of soldiers made of mud start to tear the place apart. Now they are in a race for their lives, battling all the myths and legends of the past. I have never come across a book which has made me appreciate all those history classes I took in years past. What, history, you say? Yes, I mean history, specifically mythology. 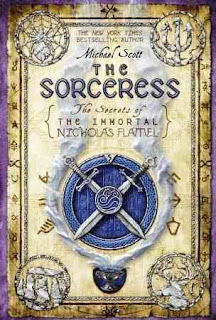 Michael Scott brings out every god, goddess, mythical creature and whispered legend from the past to create a unique view of the current world. Each one of the books in this series is so fast-paced that after reading up to the fourth book, only four days have elapsed! 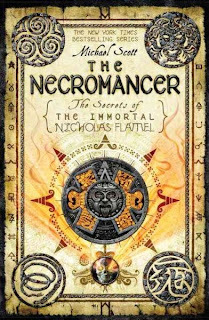 I am absolutely amazed at the how Michael Scott has managed to weave so many gods, goddesses, and myths into one thrilling series, called "The Secrets of the Immortal Nicolas Flamel". 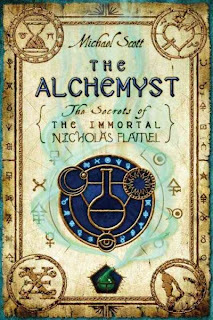 The name, Nicolas Flamel, sounds familier, doesn't it? 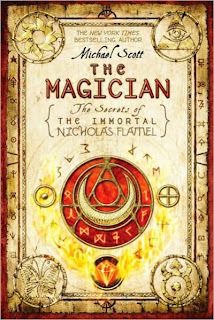 If you like the first book, check out next the three. Oh, did I forget to mention this absolutely enthralling series has two more books which aren't even published? They are definitely worth the wait. Enjoy!